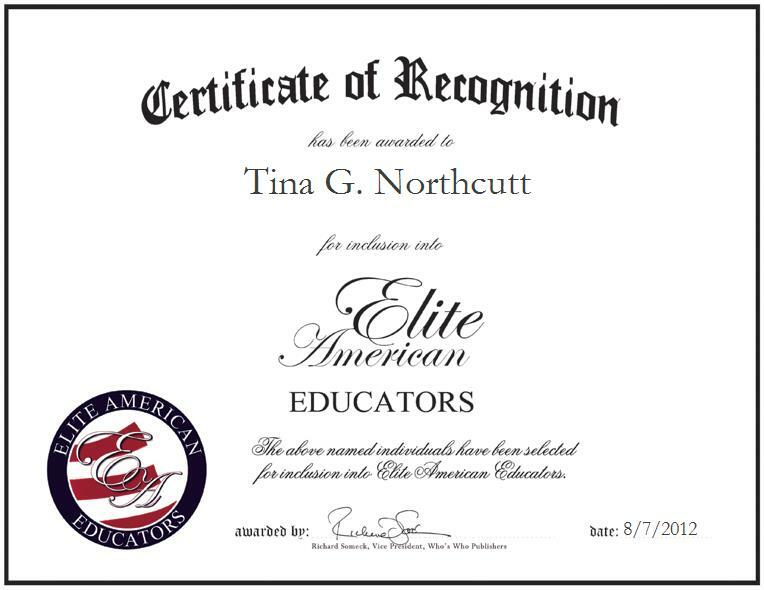 Tina G. Northcutt is a Library Media Specialist at Rowan County Middle School, located in Morehead, Kentucky. Ms. Northcutt serves as a technology coordinator for teachers, and she also teaches library skills and technology skills. She is in charge of overseeing processes, which include all purchases for the entire school, library operations and technology expenses, and assisting in research. She works as the minister of music in church, and also as a youth leader. Ms. Northcutt has spent nearly 25 years in her chosen profession, and she continues to strive for excellence in her every endeavor. In 2007, she was inducted into the National Honor Roll, and she has also been named an Outstanding American Teacher for her exceptional efforts. She enjoys fishing, engaging in fitness activities, and traveling in her spare time. Ms. Northcutt also takes great pleasure in unwinding with her family.